Disktective is a freeware utility for Windows (and Linux/wine) to trace used-up disk space on your system. Disktective reports the real size of your directories and the distribution of space inside them. A directory may contain hundreds of subdirectories each potentially containing thousands files. Simply run Disktective and let the program create a complete report displaying the real sizes of all directories and their containing subdirectories. 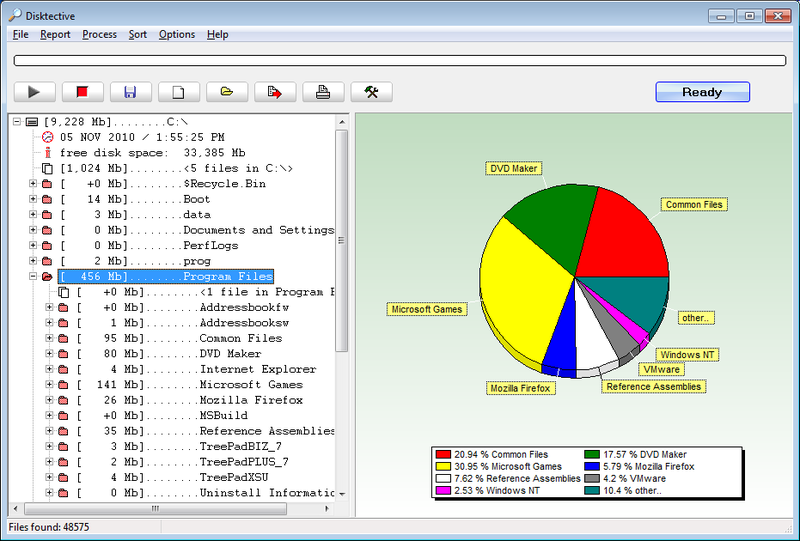 Freeware disk-space reporting tool. Supports sizes of over 1 Tb. ...... and their containing subdirectories. Disktective does not need to be installed. Just copy the program files onto your harddisk, double click on the .exe file and Disktective will start. Freeware for Windows XP, 7, Vista, 200x, NT, 98, ME, Linux/wine and all current 64 bit editions of Windows. Freebyte Disktective is freeware for personal and corporate (business, government, non-profit) use, so you can run this program in any commercial or non-commercial setting. Qweas is providing links to Freebyte Disktective 6.0 as a courtesy, and makes no representations regarding Freebyte Disktective or any other applications or any information related thereto. Any questions, complaints or claims regarding this application Freebyte Disktective 6.0 must be directed to the appropriate software vendor. You may click the publisher link of Freebyte Disktective on the top of this page to get more details about the vendor.